Today we are taking an all-time classic recipe and adding an extra refreshing twist. People have been pairing up strawberries and bananas for ages and for good reason; it’s delicious! But when we toss in a little bit of fresh basil leaves, the party in your mouth gets taken to another level. Bananas and strawberries are full of beneficial nutrients such as fiber, antioxidants, flavonoids, vitamins and minerals. Basil also contains a variety of these nutrients but carries the additional benefit of chlorophyll and powerful anti-inflammatory and anti-bacterial volatile oils. These three superfoods combine to make a surprisingly refreshing and nutrient-dense powerhouse of a smoothie. To make this smoothie, it’s as easy as placing all of the ingredients into your blender and blending for 15 to 30 seconds. Add as much or as little as you would like to get your desired consistency. 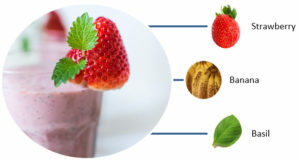 If you enjoy your smoothies colder, you can use frozen strawberries or add in a couple ice cubes. For best results, enjoy this smoothie immediately. Ready to transform your life for the better?